Tanzanite’s stunning blue, rarity, value and still affordable price make it one of the most popular gems used in fashion jewelry. Its shades vary from light sky hues, electric blues to deep cobalt – often even exhibiting flashes of violet and crimson due to its pleochroic nature. This variation of color paired with it being the ideal inexpensive substitute for sapphire are two of the main reasons fashion jewelry designers use it so commonly. Fashion jewelry or costume jewelry constitutes of jewels that aren’t of high value but instead focus on complementing a particular dress or outfit at affordable prices. When you need to go shopping for statement earrings or a pendant that you don’t intend to wear often and so don’t want to spend too much money on then fashion jewelry is what you should be looking into. Fashion with tanzanite combines low priced gemstones and metals to create some of the most exquisite jewel designs; especially vintage, art deco and statement chandelier tanzanite earrings, tanzanite studs, necklaces, tanzanite pendants, cocktail rings and tennis bracelets. With blue being one of the most loved colors in jewelry now a days, tanzanite has entered the fashion jewel market in all of these categories. A gemstone of reasonable hardness as per the Moh scale and vibrant color matched only by sapphire in the range of blues, the tanzanite rock is ideal for statement making chandeliers to go with your off-shoulder evening gown or a pendant to offset a wide necked cocktail dress. Its color also happens to match any outfit – be it deep blues and blacks, pastel tints of white or bright and bold summer hues. The sparkling blue works beautifully in either a complementary or contrasting fashion. It also happens to be a color of royalty that adds a touch of imperial style to the design. 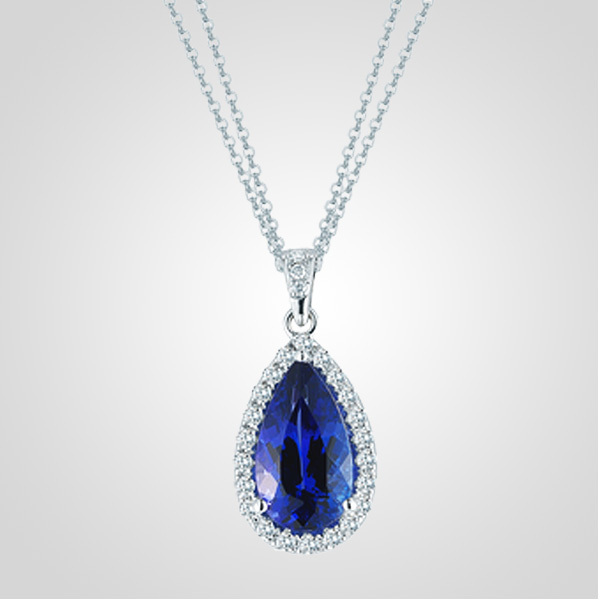 Tanzanite blue also happens to be an ultimate match to a clear stone’s grey. More often than not fashion jewelry calls for white sapphires or zircons as a substitute for diamonds, and these clear stone’s reflect and refract the blue of a tanzanite astonishingly well when set in jewelry together. Particularly halo set rings and ear studs utilize this relationship between the blue and grey in order to accent one another and epitomize the sparkle. Nothing like s statement jewel which appears to be a perfect blend of royal blue and pure unadulterated clear sparkle! Tanzanite gemstones also happen to be easy to work with thanks to their properties. Being a colored stone designers don’t always have to go for high grade stones as flawed rocks can seldom be identified by the naked eye. This makes a stone with high saturation of color just the right choice for good quality fashion jewelry sculpted with skill, ensuring that it can’t even be differentiated from the real thing! Fashion jewelry may be aimed to fulfill a one time or occasional use need of the consumer but no one wants to wear a jewel that doesn’t appear stunning – that is the whole point. Fashion jewels allow you to look your best – cut costs without sacrificing the beauty of your outfit – and tanzanite blues are a fashion jeweler’s best friend!